The Carthusian Martyrs of the English Reformation suffered martyrdom between 1535-1540 during the reign of King Henry VIII. In all, eighteen Carthusians were beatified by Pope Leo XIII in 1886 along with a large group of English and Welsh Martyrs of the Reformation. 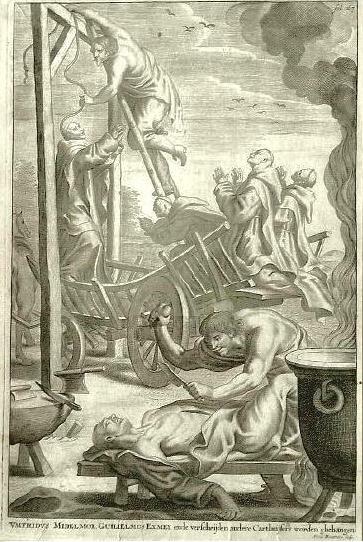 On October 25, 1970 Pope Paul VI canonized a representative group of forty martyrs of the English Reformation, of which three, John Houghton, Robert Lawrence, and Augustine Webster were Carthusians. 1. Blessed Humphrey Middlemore, vicar of the London Charterhouse, executed at Tyburn, London, on June 19, 1535. 2. Blessed William Exmew, procurator of the London Charterhouse, executed at Tyburn, London, on June 19, 1535. 3. 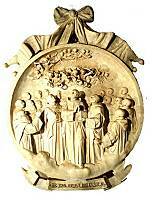 Blessed Sebastian Newdigate, choir monk of the London Charterhouse, executed at Tyburn, London, on June 19, 1535. 4. Blessed John Rochester, choir monk of the London Charterhouse, exiled by the government to the Charterhouse of St Michael at Hull in Yorkshire, executed at York on May 11, 1537, by being hanged in chains from the city battlements until dead. 5. Blessed James Walworth, choir monk of the London Charterhouse, exiled by the government to the Charterhouse of St Michael at Hull in Yorkshire, executed at York on May 11, 1537, by being hanged in chains from the city battlements until dead. 6. Blessed William Greenwood, laybrother of the London Charterhouse, died of starvation in Newgate Prison, London on June 6, 1537. 7. Blessed John Davy, deacon, choir monk of the London Charterhouse, died of starvation in Newgate Prison on June 8, 1537. 8. Blessed Robert Salt, laybrother of the London Charterhouse, died of starvation in Newgate Prison, London on June 9, 1537. 9. Blessed Walter Pierson, laybrother of the London Charterhouse, died of starvation in Newgate Prison, London on June 10, 1537. 10. Blessed Thomas Green (perhaps alias Thomas Greenwood), choir monk of the London Charterhouse, died of starvation in Newgate Prison, London on June 10, 1537. 11. Blessed Thomas Scryven, laybrother of the London Charterhouse, died of starvation in Newgate Prison, London on June 15, 1537. 12. Blessed Thomas Redyng, laybrother of the London Charterhouse, died of starvation in Newgate Prison, London on June 16, 1537. 13. Blessed Richard Bere, choir monk of the London Charterhouse and former Abbot of Glastonbury, died of starvation in Newgate Prison, London on August 9, 1537. 14. Blessed Thomas Johnson, choir monk of the London Charterhouse, died of starvation in Newgate Prison, London on September 20, 1537. 15. Blessed William Horne, laybrother of the London Charterhouse, hanged, disembowelled, and quartered at Tyburn, London on August 4, 1540. 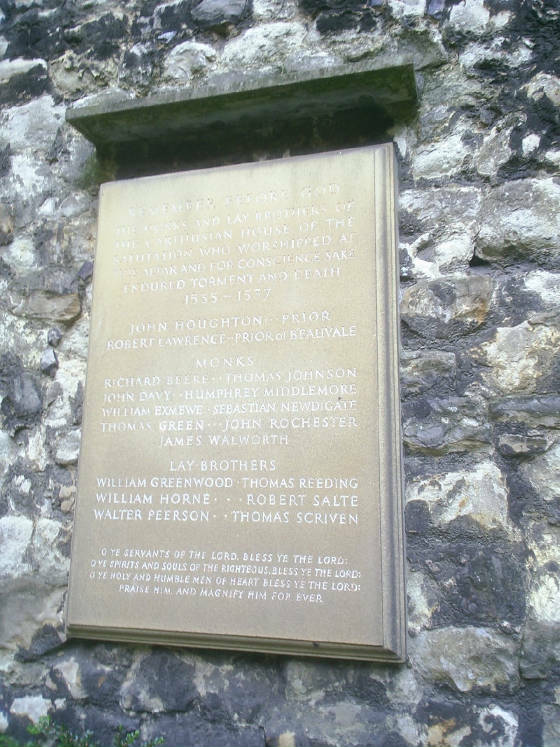 This plaque, near where the high altar of the monastic Church used to stand, records the names of the martyrs. On 4 May 2007 the clergy and choristers of Westminster Cathedral celebrated Vespers at the London Charterhouse. This was the first public Catholic ceremony held there since the Reformation. To read more the proceedings and see photo's just follow the above posted link. Let us look forward to this being an annual honor to the martyrs. We join our prayers in union with the diocese of Westminster for the Martyrs of the English Reformation. Maranatha!